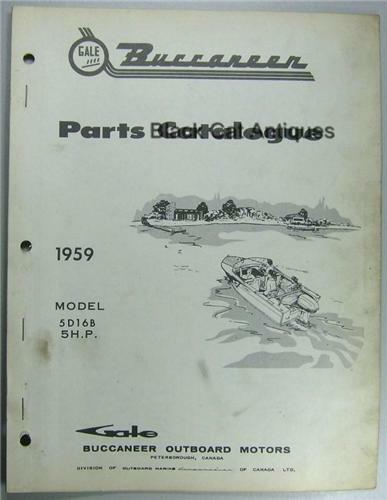 Up for sale, we are offering an original, 1959 Parts Catalog for Gale Buccaneer Outboard Motors - 5HP, Model #5D16B. This is a used catalog from a local marine and small motor business filled with great diagrams and information relevant to this classic outboard motor. Condition: This catalog is used with soiling, however it is easily readable and useable. Please enlarge the photos to determine the condition of the guide. Size: The manual measures approximately 11" high by 8.5" wide.